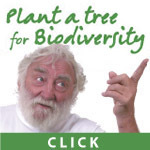 In October 2010, in Japan, governments agreed to the Strategic Plan for Biodiversity 2011-2020 and the Aichi Targets as the basis for halting and eventually reversing the loss of biodiversity of the planet. Biodiversity is the variety of life on Earth. It is essential for sustaining the natural living systems or ecosystems that provide us with food, fuel, health, wealth, and other vital services. Humans are part of this biodiversity too and have the power to protect or destroy it. Currently, our activities are destroying biodiversity at alarming rates. These losses are irreversible, impoverish us all and damage the life support systems we rely on. But we can prevent them. We need to reflect on our achievements to safeguard biodiversity and focus on the urgent challenges ahead. Now is the time to act. So why trees? Firstly, they are the longest living organism on the planet and will provide homes for countless living creatures for many hundreds of years. Secondly, we desperately need more trees to replace our aging native broad leaved trees. Quite simply, trees help to stitch the world back together. For a one off sum of £10, you can plant a tree in the UK. 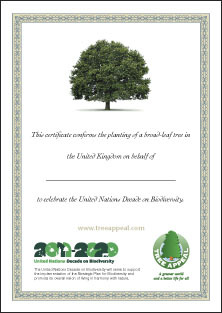 You can print out a posh certificate that we will email to you to commemorate your contribution. Working together, we can help protect our valuable ecological heritage.